Richard Figiel established the Silver Thread Vineyard in 1982, planting 10 acres near Lodi, NY to vinifera varieties and growing them organically to make natural wines. He sold the property in 2011 and currently writes a column on NY wines for Wines & Spirits Magazine. He had previously published Culture in a Glass: Reflections on the Rich Heritage of Finger Lakes Wine in 1995. Happily for the reader he writes well and where appropriate turns to literary allusion or leavens the text with touches of dry wit. Most important of all, he reveals the history of wine in New York State by means of a sensibly-organized account that starts with the movements of the glaciers of the last Ice Age on through to the diaspora of the late Twentieth and early Twenty-First Centuries, when wineries, vineyards, and winemaking had spread throughout the state after a small and inconspicuous beginning in the Seventeenth. Which leads to this book and the far from arrow-straight history of New York wine, which instead ambles along from one wandering post to another in time and geography. 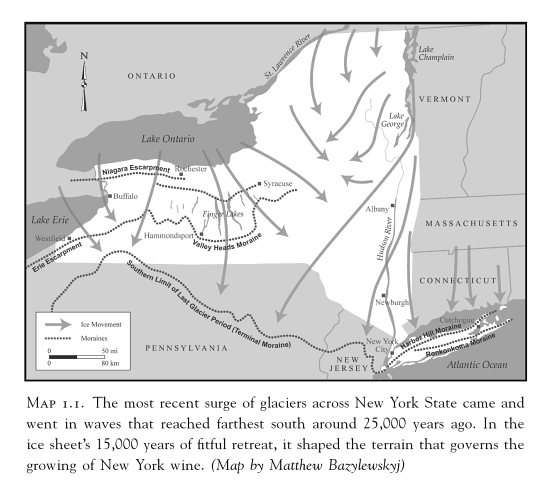 Chapter 2, “Beginnings in the Hudson Valley,” recounts the earliest attempts at growing wine grapes in the region, including the many failures planting vinifera varieties. Determined growers then set about planting native varieties like Isabella and Catawba while some began experimenting with hybrids—that is to say, interspecies crossings, resulting in some of the most successful hybrids for commercial vineyards, starting with the Iona. The history is complex but Figiel successfully manages to thread all the different paths that winegrowing took in the 17th, 18th, and 19th centuries into a coherent whole. The following chapter, “Settling in the Finger Lakes,” is an exploration of the very complicated story of wine in what is today the premier region for Riesling in the country. When first explored in the early 17th century, large amounts of native grapes were found and it is possible that the earliest record of winemaking may date to before 1668, but this is an inference from a text by a missionary who writes about “vines, which bear tolerably good grapes from which our fathers formerly made wine for the mass.” Rev. William Botwick of Hammondsport in the 1830s may have been the first to plant grapes in the Finger Lakes for making wine and disseminate grapes for winemaking to his neighbors, and it was found that Isabella, as an earlier-ripener than Catawba, took best to the climate of the lake region. It took a long time for vinifera to catch on in the Finger Lakes, and that was, of course, thanks to the hard work of Dr. Konstantin Frank in the 1950s. Chapter 4 is devoted to “Western New York,” which in this case means not only what would become the Lake Erie Region AVA but also the area from Rochester to Niagara, including the Genesee Valley, where a winery was established by Samuel Warren in 1834, 5 years before the Jaques winery was opened in Washingtonville in the Hudson Valley. The Irondequoit winery was established on its eponymous Bay on Lake Ontario near Rochester in 1841. A winery cooperative was formed on the Niagara Escarpment near Lockport in the 1860s. Much of the wine that was made for sacramental use. But where are these places, some of which are very little known? A map would be helpful. “Collision of Cultures” (Chapter 5) covers one of the most interesting and fractious periods in American wine history—the rise of the anti-alcohol movement that led to Prohibition and the struggle of the producers of alcoholic beverages to resist that movement. As early as 1808 there was a reaction against the excessive consumption of spirits in particular, when a doctor near Glen Falls despaired of healing hard drinkers and founded the Moreau Temperance Association, which was aimed at spirits and brews, but not wine. By 1833 the American Temperance Union was established and the question became one of “which alcohols” to ban outright. Those who joined the Union and swore to totally abstain from the imbibing of any alcohol had a “T” placed by their names, hence the term ‘Teetotaler.’ Long before Prohibition, in fact, Rutherford B. Hayes, a teetotaler, was elected President in 1877. Figiel writes that “he drained the nation’s first household Dry . . . . Visiting dignitaries were confounded: ‘Oh, it was very gay,” one European ambassador said of a state dinner with the President, ‘the water flowed like Champagne.’ Individual towns and counties throughout the country and in New York began passing laws banning the sale of alcohol; indeed, the New York legislature passed a law restricting the sale of alcohol in 1845. That law was rescinded two years later, but the battle lines were drawn and the fight was on. The history of Prohibition is well-known and often told, and Figiel tells it with well-selected anecdotes to enliven the tale. The sixth chapter, “Restart,” is about the hardscrabble road to recovery from Prohibition. Chapter 7 is devoted to the Revolutionaries, those who changed the attitude and approach to grape growing and wine making in the State and withal most of the Eastern United States. There are capsule accounts of the work and accomplishment of five key figures who helped bring about significant change in the wine industry: Everett S. Crosby, Frederick S. Johnson, Konstantin Frank, Walter S. Taylor, and Mark Miller. Crosby was introduced to wine “in the rumble seat of a roadster after high school basketball games” during Prohibition and went on in 1950 to found High Tor Vineyard in the Hudson Valley. It was the first vineyard planted exclusively to French hybrids and the wines found a positive reception in wine shops and restaurants in New York City. In 1960 Johnson would establish his vineyard and winery on the Lake Erie escarpment and plant mostly hybrid grapes, bringing the region into the wine world after years of producing table grapes and grape juice. 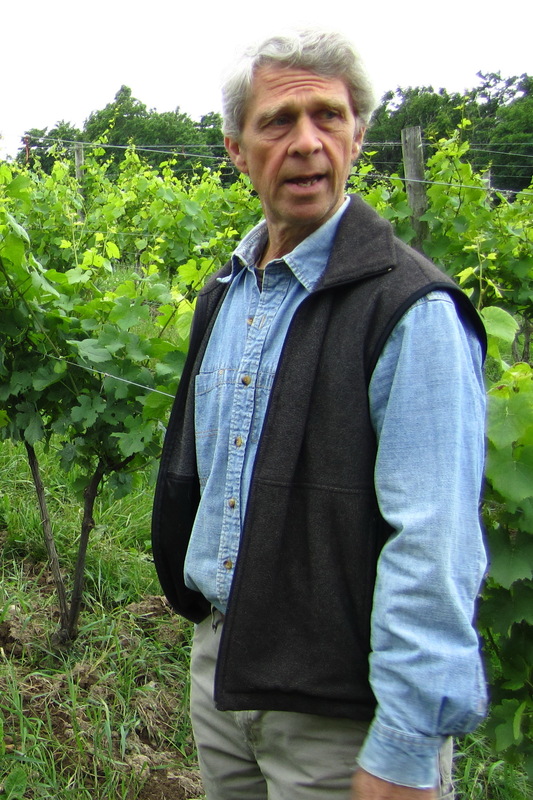 Frank, a difficult, determined, and uncompromising man is the father of vinifera wine in New York. Over a dozen years, starting in 1953, he planted a quarter of a million vines of a dozen vinifera varieties grafted to selected American rootstock and proved definitively that European vines could grow and thrive in the extreme cold of the Finger Lakes. Walter S. Taylor has to have been one of the most colorful characters on the wine industry stage: a rebel with a cause in opposition to big business and its overreaching attempts at control, particularly over the issue of the Taylor family name. Once Coca Cola had acquired the Taylor Wine Company it had an injunction issued against Walter S. using his surname on his own wines at Bully Hill. His irrepressible humor and anti-establishment outlook had him take on a goat as a mascot and quipped, “You can’t get my goat.” But read the story. And there was Mark Miller, owner of Benmarl Vineyards, who helped bring about a transformative law, the Farm Winery Act of 1976 that changed the New York wine industry forever. 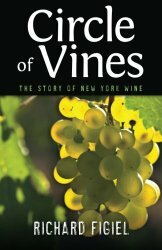 This is followed by a chapter devoted to Long Island, the last major wine region to be planted to wine grapes, unique among all the State AVAs in growing vinifera varieties only, with a tiny exception. Its history is comparatively brief, with the first vinifera vines planted in 1973 by Louisa and Alex Hargrave. Amateurs in Long Island, they showed that European varieties could produce excellent wine there and today Long Island has the most extensive plantings of Merlot, Chardonnay, Sauvignon Blanc, Syrah, and Cabernet Franc in the State, not to speak of nearly twenty others as well, including Pinot Noir, Chenin Blanc, Dornfelder, and Albariño as well. Circle of Vines bears comparison with Hudson Cattell’s Wines of Eastern North American, previously reviewed in a post on this blog. However, while there is some overlapping history, Catell’s book touches on the period From Prohibition to the Present (i.e., 2013). It is meant as a “History and Desk Reference,” and is a far more scholarly approach than Figiel’s, replete as it is with endnotes, an extensive bibliography, and seven appendices with tables and charts. This is not to denigrate what Figiel has done, but his is a less formal approach, and he does list his sources and include an index; his book is 169 pages devoted to just New York, while Chattell’s 235 pages cover the entire gamut of Eastern wineries from Maine to Florida and all the way to the Mississippi River. Both are informative and very useful resources. A reader would be glad to have them both. Regrettably, the book has very poor-quality illustrations—given their half-tone newsprint reproduction—and there are no maps to support the text, apart from the one that shows the movement of the ice sheet that covered the state over 10,000 years ago. One can only hope that if there is a second edition there will be a map for each chapter as well as higher-quality images. Circle of Vines, The Story of New York State Wines, by Richard Figiel, 2014. Excelsior Editions imprint of SUNY Press, Albany. 194 pages with appendices and index. 31 monochrome half-tone illustrations, including one map. This entry was posted in Miscellaneous, References, Vineyards, Wineries and tagged Circle of Vines, Hudson Chattell, New York Wine, NY Wine History, Richard Figiel on 25 January 2015 by JoseM-L.